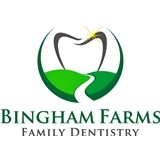 Bingham Farms Family Dentistry (Bingham Farms) - Book Appointment Online! At Bingham Farms Family Dentistry, we are committed to providing our patients with compassionate and professional dental care of the highest standards in a comfortable and relaxed environment. We utilize the most current dental technologies and techniques to help you achieve a smile that you can be proud of. At our practice, you will receive individualized treatment based on a careful diagnosis of your dental health. He was very personable. I have not been to the dentist in a while, hence why I was there for a toothache, so I was expecting to be lectured on 'proper teeth care' (or at least made to feel guilty). He was understanding though and made sure we were solution focused. Great visit, I will be back for my regular check ups!